Every CO2 and PCP air rifle resealed by the Archer Airguns Repair Center is returned to its owner with a comprehensive repair docket signed by the repair specialist undertaking the reseal. This repair docket outlines every step of the repair that was undertaken, together with the results of the post-repair testing and comments on the internal state of the gun. A sample is shown above. One interesting finding to date is the amount of corrosion being found during Benjamin Marauder PCP air rifle repairs. Surprisingly, this is not corrosion to the gas tube, but is most usually most evident on the non-ferrous gauge block inside the tube. Conversations with owners strongly suggests that this corrosion is being caused by humidity in the fill air, usually by filling from a hand pump with no moisture trapping capability. In the worst cases, we have felt it best to replace parts because of this - with the customer's agreement, of course. All replaced seals and parts are returned with the resealed gun, giving the owner further confidence in the quality of the repair. So, if you're filling your Benjamin Marauder from a hand pump, it's clearly the best policy to choose a pump having a moisture trapping capability, particularly if you live in a State that has high humidity levels in the air. Archer Airguns is also an authorized Crosman Service Center specializing in repair services to Marauder, Discovery, and Challenger PCP air rifles. 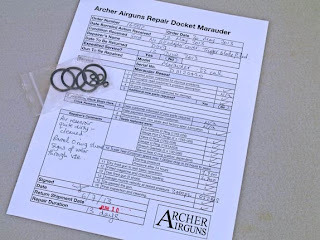 Uniquely, Archer Airguns repair services can be ordered online without the need for tedious telephone calls and estimates. We offer transparent pricing and a guaranteed turnaround time for repairs. The standard turnaround time is 15 working days (3 weeks), but if it’s vital you receive your airgun back as soon as possible, there’s also an Expedited Service option that provides a 10 working days (2 weeks) turnaround. For full details, please check out the Airgun Repair Services section of our website. Archer Airguns' full disclosure practice of delivering their business services amplifies my confidence in their commitment to customer satisfaction and fostering repeat business through the product developments that they offer. The QB78 Repeater is now available and shipping.